Start to Make Your Own Pellets! 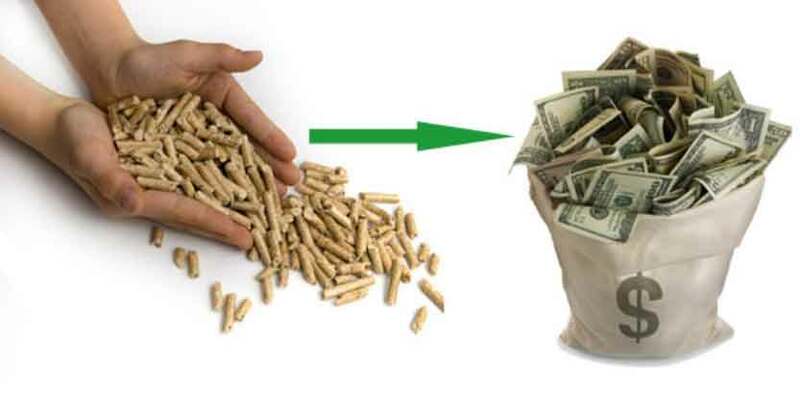 Pellets, especially wood pellets market is heating up over the last two decades. Pellets can be used as animal bedding, absorbent, fuel etc. They are extremely dense and can be produced with a low moisture content that allows them to be burned with a very high combustion efficiency. Pellets can provide energy for commercial or residential heating, cooking and even power generation. Data from Navigant Research suggests that global revenues from biomass power generation could reach $11.5 billion annually by 2020. Speaking of making your own pellets, we are talking about savings and profits. According to an American Council on Energy Efficient Economy (ACEEE) study, taking the efficiency of space heating into account, one ton of pellets can roughly displace 150 gallons of heating oil. At the same cost, you can produce a larger amount of heat with making pellets for home heating. In other words, the decrease of the fuel budget saves your money. And the better news is, you can actually profiting from the pellets making business. As more and more people began to choose pellets as their home heating fuel, make them in large scale become a new idea for bring in. The Europe and US pellet heating market can basicly ensure the pellets will sell. Although starting a business is not that easy, it still worth a try. By the way, for home owners or beginners who want to run a small scale pellets business, we offer our small pellet mills and plants. Please browse our new site www.pelletequipments.com for more information. This site is especially set for small pellet machines, any questions about small pellet machines, leave messages here, and you will get satisfactory answers. The materials that can be used to make pellets are very extensive. Most of the wastes you can easiliy found in your daily life can be made into pellets for different purpose, such as paper, cardboard straw, corn husks and stalks, rain, grass clippings, yard wastes and other kinds of agricultural and forest wastes. The most commonly used pellets are wood pellets which can offer a remarkable amount of heat as a new, environment-friendly fuel. Generally speaking, hard wood pellets are considered to be better than softwood pellets since hardwood pellets contain more heat energy. However, hardwood is more difficult to process so it is more expensive than the softwood as well. In fact, whether the materials are hardwood or softwood, when they are compressed into high quality pellets, the density are so similar that they both can work smoothly in your pellets stove. If you are interested in making your own pellets, there are several process you may want to know. First, size reduction. The raw material you have must be small enough to fit into the die. If you use sawdust-like material, you can skip this process. But if you intend to deal with large-sized materials such as logs and bamboos, it is important to reduce the material size into an inch or less, otherwise, you may not get good pellets as you wish, or, worse, your pellets mill may break. Second, drying. Proper moisture content is the key to make quality pellets. According to the materials, the moisture content should be controlled in the scope of 10-20%. To dry the materials, you can just leave them in the sun and wait, or you can use an industrial slow heating oven to dry them in a more efficient and sophisticated way. Third, mixing. In order to ensure the consistency of pellets, all the materials must be uniform and consistent in density. This process is hardly to complete without specialized equipment, you may need a rolling drum or an agitator to work with the batch mixer. Then, you can began to produce pellets. To produce the pellets, you need a pellet mill or a pellets press which includes a die and a roller. The die is a piece of metal with many holes from which the pellets can be push out after compression, while the roller compress the materials into high-density small pellets through the hole. Fifth, Sieving. The pellets you make will not be perfect. Some of them may fall apart and you should get rid of them from the good ones. Shake or sift the pellets through a screen, then you can get the properly formed pellets. And Sixth, cooling. The pellets comes out fresh from the pellet mill are hot and moist. You should cool and dry them slowly in this step. Spread them out and let them cool naturally is fine, and you can get a blower or a fan to help you. At last, you should know how to bag and store the pellets. Pellets should be stored in a moisture free environment, so most people seal pellets into plastic bags. If you make pellets for you own home, follow these steps will be enough. But if you make them for sale, you should also consider how to transport them to the consumers. Follow the steps mentioned above, you are ready to make your own pellets. However, there are some equipment you will found very helpful in the whole pellets making process like hammer mills, pellet mills, heating ovens etc. With professional pellet mills or plants, you can get quality pellets more easily and efficiently. We are AGICO who provide you with all kinds of machines you need in the pellets making. GEMCO, one of our subsidiary company, is one of the earliest factories specialized in designing and manufacturing equipment of complete wood pellet line. We are qualified for both ISO9001:2000 and CE certification. We serve the recycling industry, compound feed industry and grain processing. In recent years, as the small scale pellets business become more and more popular, our home-use pellet mill thrives. We acknowledge that many people may have questions about pellet plants before make a purchase. Thus we offer online consultation service as well. For home owners or you are running a small scale pellets business, we offer our small pellet mills and plants. Our production can be delivered to your home for free and we have professionals to help you with the assembly and commissioning of the pellet machine. Now, small pellet mills and plants have become our best sellers. If you're interested, please browse our new site www.pelletequipments.com for more information. This site is especially set for small pellet machines, any questions about small pellet machines, leave messages here, and you will get satisfactory answers. For large scale pellets business, we offer you the complete pellet plants and help you to set up your factory. As the demanding of fuel pellets grows, it is a wise choice to become a pellets manufacturer or supplier and start a profitable business. Make AGICO your partner, we won’t let you down. Contact us now and start to make your own pellets!